“La Coste is a château that looks like a fortress, without the slightest regularity. The approaches are quite steep and unpleasant because of the rockslides and the height of the mountain. There is no shelter anywhere near the château, a defect from which Provence in general suffers, there being no patches of wood and very few virgin forests of white oak, the oak of France. 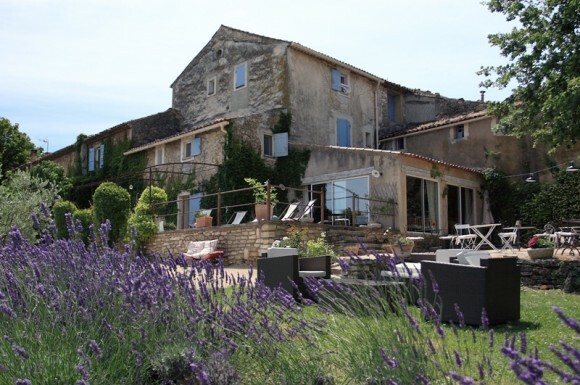 In the heart of the Luberon just outside the village of Lacoste, the bed and breakfast Domaine de Layaude Basse lies under the gaze of the Château of the Marquis de Sade, totally renovated by Pierre Cardin. The upper floors and the grounds of the Château are open to visitors in the summer. From an immense terrace and a large swimming pool, guests have a panoramic view of the Luberon and Mont Ventoux, taking in the villages of Goult and Bonnieux. You can roam through a shaded verdant garden and thirty acres of land that make up the Domaine, and greet a few of the friendly mules which your host Olivier Mazel raises. 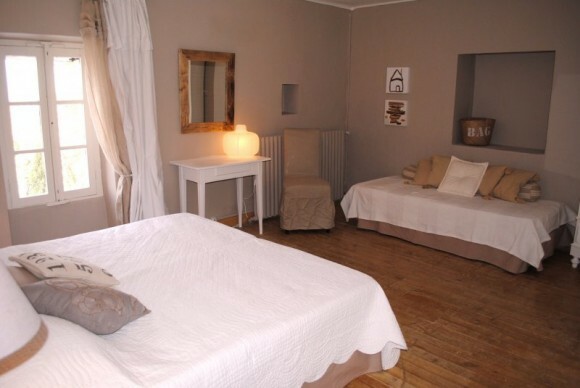 Within the large renovated farm house, there are five rooms accessed through a private entrance. The stone-walled room on the ground floor has a door opening to the courtyard. The other rooms on the first and second floors have a contemporary white-dominated décor with king size beds. A few rooms have a mezzanine for an additional bed. All rooms have private bathrooms with showers and are air-conditioned. Children of age six and older are accepted. In the village of Lacoste, there are two cafés: the Café de Sade and the Café de France. The farmers market is on Tuesday morning. The village serves as the French campus for the Savannah College of Art and Design, which adds a dimension of youthful energy to the village. In July, Pierre Cardin hosts the Lacoste Festival of music, opera, dance and theater. Directions: East on D900 towards Apt, after Lumières, take D106 to Lacoste across a small bridge over the Calavon. 1KM before Lacoste, left onto D108 to the Chemin de St-Jean, the Domaine is on your left. Coming from Apt on D900, take D108 all the way to the Chemin St-Jean and the Domaine. 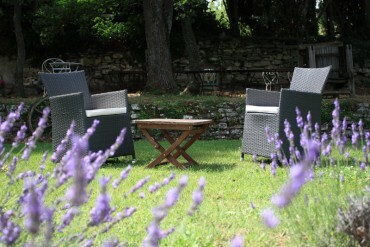 This entry was posted in Reportage and tagged B&B, Gites, Hotel, Lacoste. Bookmark the permalink.